Nothing here is for sale or trade. The information in this site represents years of research. Please give credit where credit is due when reposting elsewhere. This is my collection of Detroit Lions game used, game ready, and team issued jerseys, representing the different years, styles and manufacturers from 1969 to present. The site is organized by manufacturers and era. Quarterback and Throwback jerseys are also shown in special sections. a pair of the Honolulu Blue road pants from 1998. Of course, all uniform designs, logos, etc. 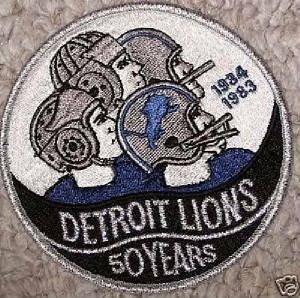 shown are the intellectual property of the Detroit Lions, the National Football League, their subsidiaries and / or affiliates. This is a personal website, not affiliated with the Detroit Lions or the National Football League.